For a bit of hacking I want to do, I need to implement concurrency between two processes sharing the same memory. So I looked into how to do it (this is all under Linux). My first stab was to look at the old SYSV shared memory interface - but that was kind of ugly, then I looked at pthreads and thought the same. Isn't there a simple way to do fork() without splitting the memory? 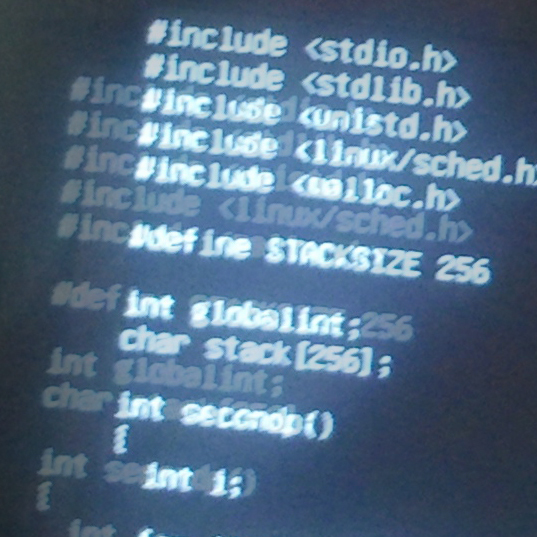 Turns out, Linux does have such a mechanism, in the clone() function call. However, there are some pitfalls that one needs to be aware of. Let's see the code first, though. Pretty standard stuff, but note the last one: it's important to pick that rather than <sched.h> (as the man page claims), since otherwise you don't have the necessary constants defined! The lone int is the only memory that I'm using to communicate between the threads for now. 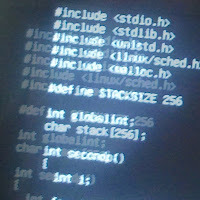 The stack however, is only used by the child thread/process. It is visible to the parent, but it's not easy (or reliable) to use it to communicate with the child. Now let's define the code for the child process. Now let's have the main program. I initialize the stack so I can observe what happened to it during execution, filling it with a simple 010101... pattern. Next, the interesting bit. The first line creates the child process, given the pointer to the function as the first argument. The second argument is what that process gets as a stack - but note that the pointer points to the TOP of the stack! This is x86 specific and MAY (or may not) be different on other architectures (ARM? amd64?). The third argument, the options, is what creates the magic to make this shared memory scheme work. Without it, clone() behaves more like fork(), giving the child a copy (-on-write) of the parent memory space, which is exactly what I don't want. Other options allow you to copy or share specific elements, like the file I/O table etc. Read the documentation. Lastly, the following arguments are passed to the child function - useful in many instances, but not used here. Clearly, the global int is modified by the child process while being read by the parent. The stack display is interesting, showing clearly how it's being filled towards lower memory. A x86 expert could probably explain clearly what is there and why the stack is not written to contiguously (presumably, some of it is allocated byt never written to). Make sure you know which way the stack grows, and how big it'll get! If you get this wrong, it'll clobber the parent variables - if you use malloc() instead, you'll get a memory fault (which is preferrable since it's slightly easier to diagnose). 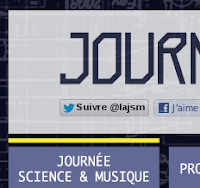 A few months ago, I got roped into helping to get the "Journée Science et Musique 2012" event off the ground. Mostly, my contribution to date has been to be a part of the team wrangling an ugly mess of HTML, PHP, and CSS into shape. Well, as of yesterday that abomination is live and open to the public. As we get closer to the date, I'll probably get involved into other parts of the event as well - in fact I have two demos that I'm working on that we might show off at the event. I'm looking forward to it, it should be a lot of fun.